The embossed 1-liter "Grappolo"bottle is designed to sell in both retail and food service sectors. It is especially popular among consumers who use vinegar frequently and can realize a savings by purchasing a larger quantity. 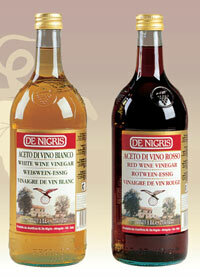 The de Nigris trademark is a guarantee that the products are made from 100% wine.